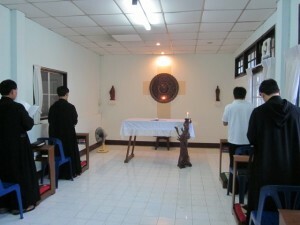 Benedictine monasticism as it is lived by men has now expanded to Thailand. The Monastery of Saint Benedict is a work that has been in process for a few years, at least since 2010. Asianews.it ran a story the other day about the new foundation made by Benedictine monks from Vietnam where there is already a sufficient monastic presence (for now) and gladly supported a move to their neighbors in Thailand. Five monks populate the Monastery of Saint Benedict with ten cells, eight guest rooms and a chapel located outside the city of Chiang Mai in northern Thailand. The monastery is located in the diocese by the same name. According to 2006 statistics, Catholics make up .8% of the population with more than 46,000 faithful. The new monastery was instigated by the Archbishop Antonio Mattiazzo of Padua. Gratitude to Archbishop Mattiazzo is well deserved for his desire to be generative. Claudio Corti’s article is here. Saint Benedict and Saint Scholastica, pray for this endeavor of the new evangelization. Today, the Holy Father was represented by Ennio Cardinal Antonelli, President Emeritus of the Pontifical Council for the Family to be his Special Envoy at remembrance celebrations at the Abbey of Montecassino on March 21. As papal envoy, the Cardinal will attend the 70th Anniversary of the Destruction and Reconstruction of Abbey of Montecassino. The date is the anniversary of the death of Saint Benedict of Norcia. 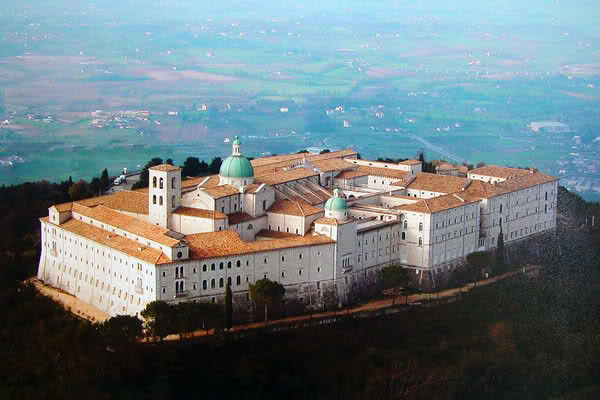 Montecassino as a community of Benedictine monks founded in 529 by the saint, suffered several destructions and reconstructions of the centuries, the last one being 15 February 1944 bombing by the Allied troops in the Second World War. In four months, the Battle of Montecassino there was about 200,000 causalities (on both sides). The monks oversaw an immediate and exact reconstruction at the war’s end between 1948 to 1956. Joseph Breccia Fratadocchi led the reconstruction. The Benedictines still live at Montecassino. One of the missions if you will, of the Communio blog, is to share the Good News, to share the ways in which the Lord is incarnated today. One of the areas I show concern for is the monastic vocation, particularly the beauty of the life given to us through the Rule of Benedict and lived in Benedictine monasteries. 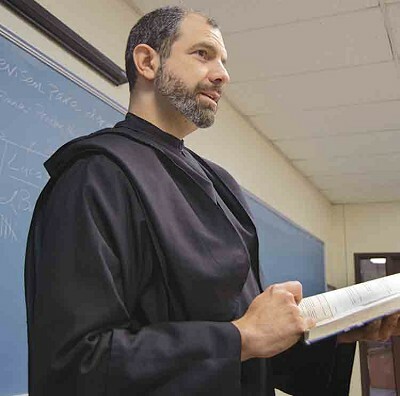 Recently, the abbot of St Anselm’s Abbey (Washington, DC) gave a radio interview attending to the Benedictine vocation in which he opens up a few facets of the life. Abbot James’ interview can be listened to here. St Anselm’s Abbey is a Benedictine monastery located in NE Washington on 30 acres monks first started in 1924 locally before moving to its present place on South Dakota Avenue. The Abbey is part of the international English Benedictine Congregation; two other US monasteries belong to the EBC (St Louis Abbey and Portsmouth Abbey). The monks St Anslem’s come from all over the USA; you might say that the Holy Spirit has called many to a life that has a certain richness providing the common life with a variety of ages, experience, and intellectual interests and the like. Over the years the Abbey has been a family with abundant gifts in the men who professed vows there. Abbot James mentions that recently three monks made first vows, and some others are coming to discern a monastic vocation in February. Benedictines pray and work. In fact, it is said that the first work of a monk is pray but recalling the Rule of Benedict a monk also has to contribute to the sustenance of the common life. There is a regular, daily, round of prayer –the Divine Office–, the Sacrifice of the Mass, personal prayer which informs and forms the work is the education at CUA, Trinity College, and since 1942 a middle and high school for boys, a guesthouse where guests are received as Christ Himself. Hospitality is never lacking in a Benedictine monastery. Abbot James speaks of the booklet From 5-9 in the interview which described the monastic life and inspired him to take the step to follow Christ as a monk at St Anslem’s Abbey. The process of discernment allows for gentle movements of the Holy Spirit to work on the soul. the monk who in ordinary circumstances takes to any work with a zeal which burns out his fire of strength and health is departing from what is for him the way of salvation. It is not a virtue for the monk, as it might be for the missionary, to lack time in which to attend the common recitation of the Divine Office, read a certain amount, and mix with his community. And hence there should be in the Benedictine monk a certain restfulness, a contentment, not in doing nothing but in doing the familiar, even the monotonous and the ritual; an ability to remain physically unmoved and unexcited, to produce, in fact, that stability which his Founder [St. Benedict] made a distinguishing and on occasion a unique religious vow, the vow of stability, the family vow” (The Benedictines: A Digest for Moderns (St. Leo, FL: The Abbey Press, 1962), 36). The Benedictine vocation first articulated through Saint Benedict and developed since the 6th century is one of prudence, discretion, balance, moderation; the seeking of the face of God and the pursuit of Truth. The way of salvation —the pursuit of heaven, is the essential part for all who call themselves Christian, but it is even more heightened by those who live the consecrated life according to the holy Rule of Benedict. Saint Benedict and Saint Anslem, pray for us. One of my friends, Brother Ignacio Gonzalez, was recently recognized with 200 Catholics in the Archdiocese of Washington with the Manifesting the Kingdom Award given for outstanding service to the local Church. Brother Ignacio is a Benedictine monk of St Anselm’s Abbey. In addition to the monastic way of life, the monks of his community conduct St Anselm Abbey School. he teaches religion in the school. Brother Ignacio, a native of Texas, is a former US Marine. Read the story, pray for vocations to Benedictine life. Conor Pope offers “An Ordered Existence,” his entertaining and thought-provoking summary for The Irish Times of two days spent with the Benedictine monks of Glenstal Abbey, Co. Limerick. The article is supplemented by “The Sound of Silence: Conor Pope at Glenstal Abbey,” a five-minute video.